Enjoy a morning coffee, yoga & the sun on your face. 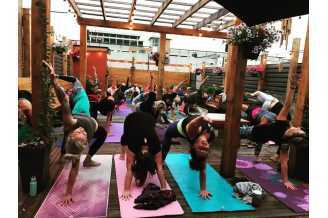 Join certified yoga instructor, Aleena McKinnon with Buddha Beats Yoga, for rise & shine Yoga on the rooftop patio at The Bean Scene. Every Tuesday and Thursday from 7:30-8:30 a.m.
All levels welcome. Please bring your mat. Please pre-register in-person at Bean Scene or by emailing buddhabeatsyoga@hotmail.com.